Discussion in 'News and Features' started by d4rk, May 15, 2012. A rare Ferrari 599 GTO, where only 599 units of such specimen is available worldwide was caught in a horrible accident involving a taxi and a motorcycle in Singapore. The aftermath of the crash has resulted in the deaths of three persons at the wee hours of last Saturday, taking place at the junction of Rochor Road and Victoria Street at 4.15 am. Reports are saying that the spot is known for being an accident-prone area. The driver of the fastest road-legal Ferrari, a 31-year-old Chinese businessman was already killed when the paramedics reached him. 52-year-old taxi driver Cheng Teck Hock, also a father of three school-going children and his 20-year-old Japanese passenger meanwhile succumbed to their injuries and died later on at the hospital. 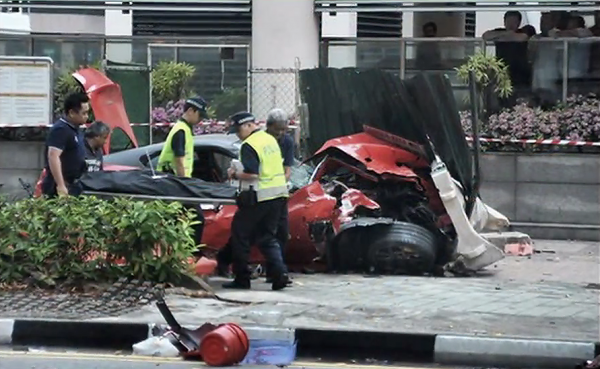 The motorcyclist and the Ferrari’s passenger however were lucky enough to survive the crash. 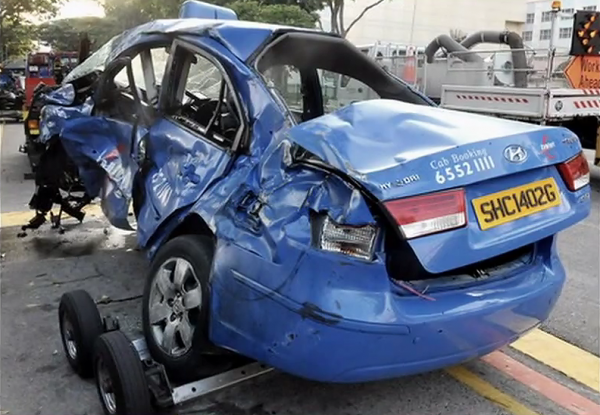 Although police are still in the process of investigating the accident, a camera mounted in another taxi caught the footage of the accident, and almost got caught in it by a hair’s breadth. 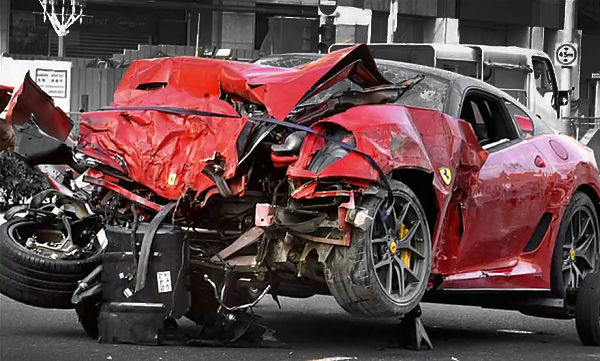 In the footage, it clearly shows that the Ferrari was travelling in high speeds and ran over a red light, hitting the taxi and barely misses the one recording it. The force of the crash was so violent that it had totally turned the left side of the taxi and the Ferrari’s front side into an unrecognizable wreck. 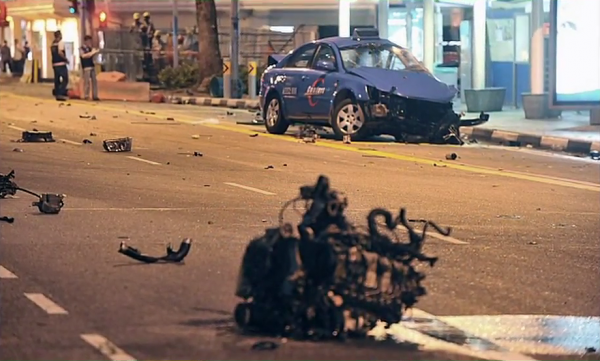 Debris of both the cars and the motorcycle were scattered all over the road, along with what it seems like an engine, most probably from the Ferrari. Thanks to Betty Goh for the tip. Wife of the deceased 599 driver wants to know who is the lady passenger. the engine on the road suppose belongs to the sonata? i thought ferrari got the engine at the back? RIP...driving wat car also have to stop at the traffic light...please respect it as other user are using it too...too arrogant to stop? F599 engine was mounted at the front. No matter how fast u drive, know when to stop. Dun run red light, n not all ferrari engine at the back. Ferrari 599 has front-mid engine layout, with rear wheel drive. 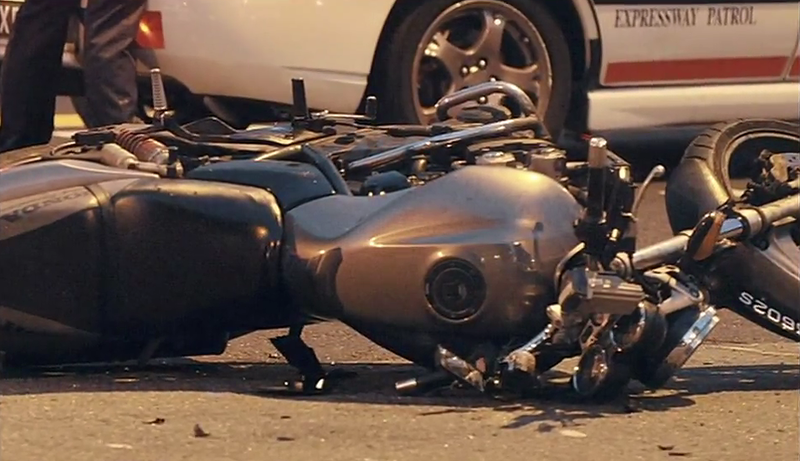 This accident reminds us to stop when the light is red, or yellow. Even when the light is green I always look left and right especially late at night or very early in the morning because at these hour people tend to beat the red light as there are very few vehicles on the road. RIP to all the deceased. Another proof that some rich people are actually idiots! To be going that fast through a red light, he's either too arrogant, showing off his car to the lady, or drunk! Feel sorry for the taxi driver, his passenger, and the GTO, what a waste! there's something wrong here..the 599 doesn't seem to stop at all..as if there was not traffic light there..i just couldn't believe it, with that kind of speed, in urban/city road and in singapore some more. maybe locals over there might give some perspective on how's the road condition, traffic light visibilty, awareness of drivers when cars passes by there and the hazards that might occur? I've seen someone else did the same damn thing, with a wira though, hit and run.